Today I time travel visited the movie set of Frankenstein, at Paramount Studios in Hollywood, 1931. I’ve been a big fan of the movie since I saw it when I was five and got so scared that afterwards I literally couldn’t sleep for two weeks straight. 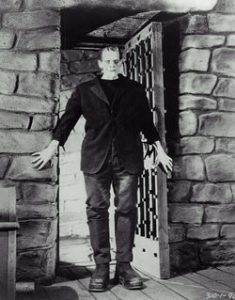 I would lay in bed each night, imagining the Frankenstein monster coming into my room, tearing me to shreds. After three days of no sleep, my parents brought me to our family doctor, Dr. Splouster, who prescribed me to drink an entire 16 oz. bottle of Nighttime Nyquil before bed. I drank the bottle that night, lay in bed, and hallucinated the monster ripping me in two. My parents brought me to the doctor again the next day,still gripping Mr. Bixby, my lucky blankey. This time Splouster prescribed me to drink an additional bottle of Nyquil for each night I couldn’t sleep, up to nine bottles. I don’t want to go into details, but I’m still going through therapy to try and recover from those trying fourteen days. Yet, I love the movie. I own the 9 DVD Special Legacy edition! So there I was on the set of the movie. 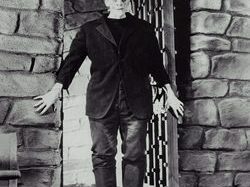 I went to the actor who played the Monster, Boris Karloff’s dressing room and knocked. The door opened, and there was the monster, seven feet high, glowering down at me. I panicked, running in circles and gargling, my go-to reaction. A soft-spoken and gentle British-accented voice from his grey-green lips said, “It’s okay, it’s just me, Boris-a-doodie-doo.” I snapped out of it and took a few long and deep breaths. Karloff offered me a chair and I sat. He sat across from me, sipping tea from the tiniest tea cup. I apologized for my nuttiness, and shared that I was a time traveler, and revealed my previous paragraph’s experiences. He believed me because he saw the results. Plus I still have the personality of a five year old.